Leipzig, Germany (2010) and Chen, R., Wood, G, (2010). Posterior view of a WCR brace. 1) Correction of the Cobb angle. 3) Sagittal plane normalization by allowing the spine to move from ventral to dorsal. This prevents the increase of the flatback syndrome which is commonly associated with scoliosis in the thoracic region. Other brace designs usually promote flatback. You cannot have three-dimensional correction that lasts (i.e. after the brace is removed) by simply having a window cut out in the brace. You must have a large space in the dorsal and ventral thoracic regions of the brace to allow for migration of tissues from convex prominences to fill concave areas. Ventral view of a WCR brace while the patient is lying down on his back. This ventral expansion area allows for the correction of the thoracic rotation and improves comfort of the brace. Other brace designs do not have this large ventral expansion area. When a brace does not have this expansion area, it treats the curves by squishing the body together (i.e. the sandwich affect). This can lead to discomfort, especially in scoliotic curves with large magnitudes. The Wood Cheneau Rigo (WCR) brace is a thermoplastic brace designed to treat scoliosis conservatively while taking into consideration that scoliosis is a three-dimensional deformity. Image used with the permission of Manuel Rigo, MD. What you get with the WCR Brace. 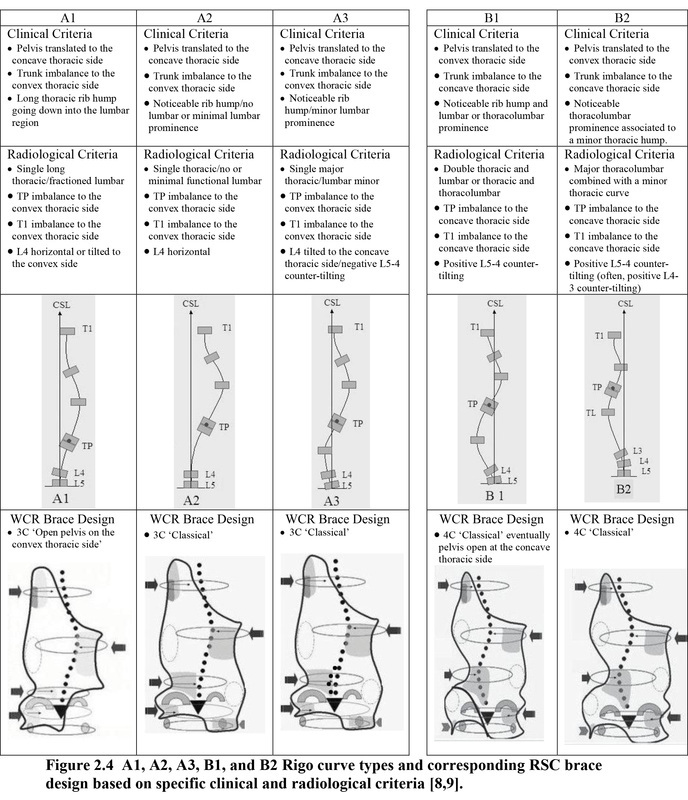 The WCR brace involves a team of scoliosis professionals from around the world working on the patient’s classification of curve. The patient curve type is individually classified from the Classification of Rigo using the x-rays and clinical photos of each patient. Based on this classification, an individual brace design from the Classification of Rigo brace designs is selected for each patient. 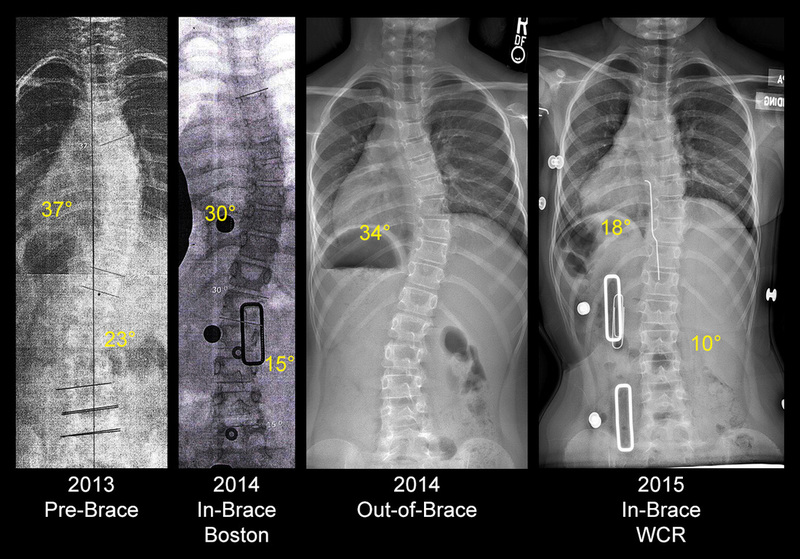 Dr. Manuel Rigo is personally consulted on WCR brace cases for verification of the patient's curve type and scoliosis brace design when necessary. This is a multi-disciplinary approach using feedback from the patients prescribing MD and Schroth or Barcelona Scoliosis Physical Therapy School (BSPTS) physical therapist in combination with the orthotist’s skills. Subsequently, the measurements, x-rays, and clinical photos are used to design and fabricate a custom-made Wood Cheneau Rigo brace. All stages of treatment (clinical photos in and out of brace, X-rays and team notes) are posted on a secure orthotic and prosthetic database (OPIE). We discuss the fittings, follow-up photos, and in-brace x-rays between the MD, Schroth Therapist (PT) and orthotist, which optimizes the treatment and results. Monitor growth/height in standing and sitting positions. Report growth of 1” to orthotist for possible adjustment. Don’t get complacent with good in-brace correction and subsequently not follow up with the orthotist for 6 to 9 months. Critical to follow up on brace fit at 9, 12, and 15 months. Report any significant changes in clinical presentation. Grant’s top 5 important scoliosis criteria for start, finish or change of scoliosis brace treatment as well as for considering full-time brace use, part-time brace use or night-time brace use (please note: the final decision is determined by your MD). Also, please note that the type of brace does not determine the scoliosis patients’ wearing time/schedule or Schroth therapy schedule. The scoliosis brace wearing time and Schroth therapy is determined by each patient’s individual scoliosis.